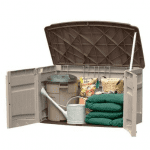 This large, and yet surprisingly attractive, vinyl garden building is a perfect and affordable place to keep a car of almost any size, but it can be used for so much more than that. It’s not only immune to rust and rot, giving it an advantage over metal and timber sheds, it’s also fire retardant. 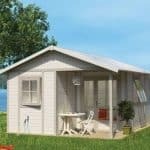 That makes it a perfect choice for a workshop, and because of its very generous dimensions, it could be used for running a home operated business as well as for pursuing a hobby. The PVC cladding itself is arranged in a shiplap fashion that’s very much in vogue, and it’s also very effective at keeping rainwater out. This is also accomplished by the tall apex roof, so whatever you decide to keep in the shed you can be sure that it will remain dry. You might not be as sure about its security, however, unless you add a padlock which unfortunately isn’t included as standard. We found the double doors to be both wider and taller than we often see, which makes moving objects of any size or shape in and out very easy. Once inside you’ll notice the amount of light supplied by the side window and skylight, as well as the fresh air that comes by way of the integrated vents. We were pleasantly surprised at how attractive this large apex roofed plastic garage actually is, and we think it will fit in particularly well in gardens that already have a PVC conservatory or next to a home that has a PVC roofline. 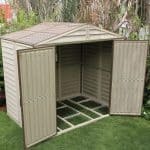 It has a shiplap style of cladding, but this isn’t only to emulate the classic design found on the best timber sheds and workshops, it also creates a solid and watertight exterior. The apex roof at the summit is also very good at keeping water at bay. It also creates a very tall interior, as demonstrated by its ridge height of 2.17m and its eaves height of 1.86m. These are both taller than we often see on the larger buildings we review, but the most generous dimensions of all were given by the overall width of 3.22m and the very long overall depth of 6.38m. The same PVC cladding is used throughout, and despite its size once assembled, the structure as a whole is very stable. That’s because the cladding is allied to a tough galvanised steel frame that gives excellent rigidity and reliability, while still being light enough to move into place during the installation. There’s no floor included, which is as we’d expect with a PVC garage as they’re designed to be attached to a pre-existing area of concrete or paving. It’s essential that the chosen area is completely level, and the area must of course match the base dimensions of 3.22 X 6.38m as a minimum. We were pleased, however, to find a steel foundation kit included which makes it easy to create a level concrete base if no suitable site exists at the moment. We think PVC is the most underrated substrate for large sheds, workshops, and garages. It can’t rot or rust, or be damaged by rodents or insects, and the latest high quality PVC is also fade resistant. In short it will last and last, which is why we were glad to see this confirmed by the inclusion of a reasonably long 15 year warranty period supplied by Duramax. This adds great peace of mind for the customer, as well as added value. The front of the garage is dominated by the double doors made from moulded PVC. They complement the cladding around them, and open to a very accommodating width of 2.24m and a height of 1.80m. This means you won’t have to worry about catching the sides of your car on the way in or out. Once the car is inside, or once it’s full of any other kind of equipment, access and egress can be done via a single personnel door on the side. One side of the building also contains a window, and we were pleased to find how much light it lets into the building, particularly as there’s also a skylight in the roof. They feature tough acrylic glass, which provide clarity whilst also being more shatter resistant than standard glazing. It was also good to see that ventilation had been included as standard, and this will be especially noticeable during the summer months. 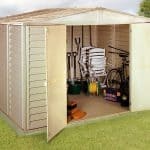 With both shed and car crime being such a problem in the UK today, we would have expected a lock and possibly even an alarm to be included as standard in a building that costs just a little under two thousand pounds. Unfortunately, however, this wasn’t the case, and the only security feature here is the tough nature of the window. It was a pity to find that there are no optional extras to buy at the time of purchasing the garage itself, but as intimated above we strongly recommend the purchase of a strong padlock and ideally an alarm as well. The handles are holed and ready to accept a lock, so attaching one will be easy. High quality PVC is used throughout, and we were pleased to see that it looked just as well as it performed. 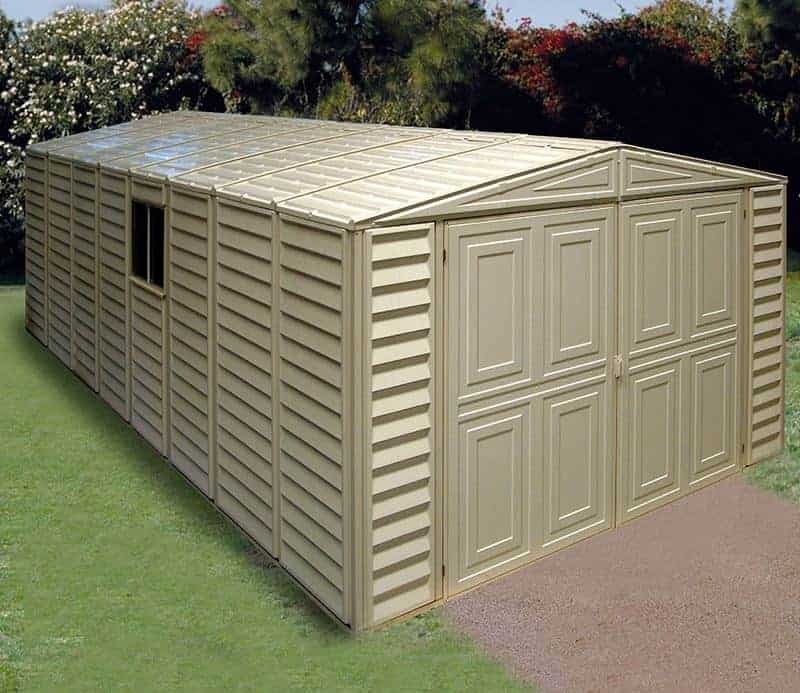 PVC is always a durable material, and with strong galvanised steel supporting it this is a very durable garage. 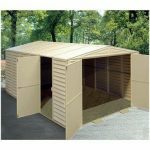 This is one of the deepest plastic garages that we’ve reviewed, and yet that doesn’t mean that the height or width have been compromised so there’s lots of room for storage or for your vehicle. Simply because of its size this is time consuming to install, so with a friend to help you’ll still need to allow two days for the operation. The instructions, however, are thorough and clear. 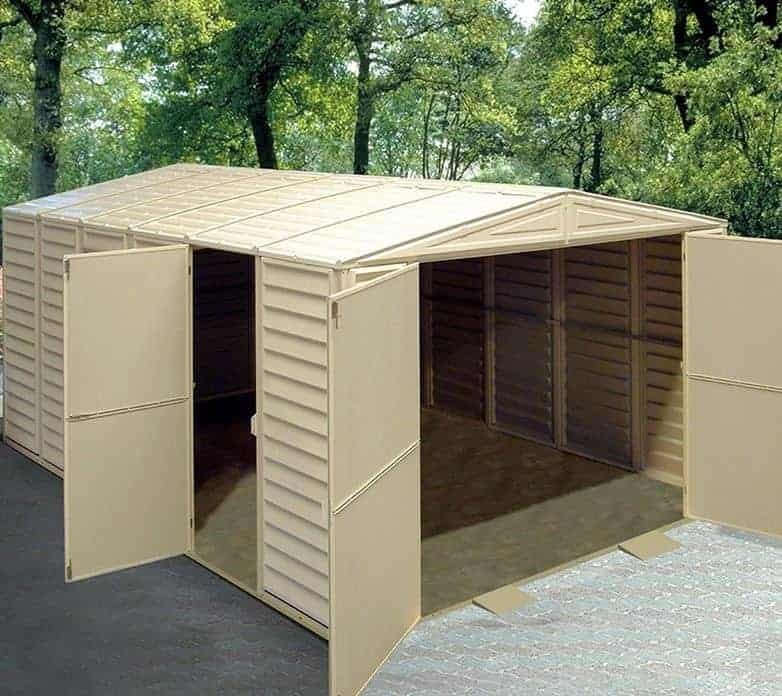 Even though this will be beyond the budget of some, we still feel this represents good value for money when compared to many other large workshops and garages. Final Thoughts: You’ll be pleasantly surprised at how much garage you can get for under two thousand pounds, and it brings added value because once it’s up there are no further treatments required during its lifetime. A padlock will need to be added, so it was a pity not to see that included, but other than that this PVC garage has everything you could need. A plentiful supply of light reaches the interior, and because there’s also built in ventilation there’s also lots of fresh air. That’s why we feel that this would also be an excellent choice as a medium to large workshop. If you contact the retailer they should be able to help.